Howey-In-The-Hills, Fla. - The Youngstown State women's golf team charged home late in the second round to grab the lead at the Horizon League Golf Championships on Saturday at the Mission Inn Resort. The Penguins have a two-round total of 614 and take a four-shot advantage over Oakland into tomorrow's final round. The Golden Grizzlies and Penguins were tied after the first round, but YSU carded a 306 on Saturday while Oakland had a 310 and sits at 618 for the tournament. The teams are 31 shots ahead of third place Green Bay. Saturday featured a back-and-forth battle, but a strong finish on the final four holes gives the Penguins an advantage heading into Sunday's final round. YSU's four scorers on Saturday were a combined three-over par on Nos. 15-18. Highlighting the late push was a birdie three on the par-5 14th hole. Conversely, Oakland was seven-over in that same stretch to give the Guins a modest lead entering the finals. Impressively, YSU has all five golfers in the top 11 of the standings. Allison Mitzel is second, Dixon is third, Aislynn Merling is sixth, Emily Rohanna is eighth and Courtney Shutt is 11th. Leading the event is Oakland's Morgan Smith who has a seven shot lead on Mitzel. On Saturday, Mitzel had a team-best round of 74. She continued some up-and-down play on the front nine with three birdies, three pars, two bogeys and double bogey for a one-over 35. On the back nine she pared eight straight holes before a bogey on 18 gave her a two-over par score for the round. She has a 151 for the event. Right behind Mitzel in third with a 152 is Dixon. Dixon was three over on the front side with a 38 and was two-over on the back nine with a 39. She had an eagle three on the par-5 14th as she carded a 77 on the day. Merling was steady again as she continued to recover from food poisoning and is in sixth place. She followed up her first round 78 with a 77 on Saturday and is in sixth place with a 155. Merling had an eagle two on the par-4 290-yard ninth hole to finish her opening nine holes at even par. She was five-over par on the back nine to finish her round. Rohanna had a solid round of 78 for the second consecutive day and is tied for eighth with a 156. On Saturday she had 12 pars and six bogeys for her six-over par score. She was just two over on the front nine. 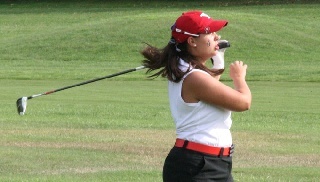 Shutt remained consistent with her second consecutive 80 and has a 160 for the tournament. She had a 39 on the front side and 41 on the back nine. The Penguins will look to win their first conference title since 2009 and reach the NCAA Championships for the first time in school history when action resumes tomorrow morning.